First, thank you from the bottom of my heart for your incredibly sweet, thoughtful, and wise comments on my recent This Is My Story post. It was a lot of my private life to put on the internet, but there were several nuggets of truth and vulnerability in that post that I’d been wanting to share with you for years now. The past couple days have been kind of…weird. I’ve been getting stomach aches at night accompanied by this feeling of really uncomfortable fullness. I can’t tell if it’s me eating too much or if something isn’t quite right. Let me tell you…it’s no fun feeling bloated and yucky when there’s the most delish brownies waiting to be eaten downstairs! Speaking of brownies, I’m posting the most INSANE, best-ever recipe for vegan brownies tomorrow. Don’t miss it! Oh, and I just deleted Instagram, Facebook, and Twitter from my phone because I’ve been feeling weirdly dependent on social media the past couple days. I’ve been scrolling through and getting lost in the internet madness a ridiculous amount and that scares me. Gotta nip that in the bud real quick! Scrambled eggs with local sourdough toast and berries. 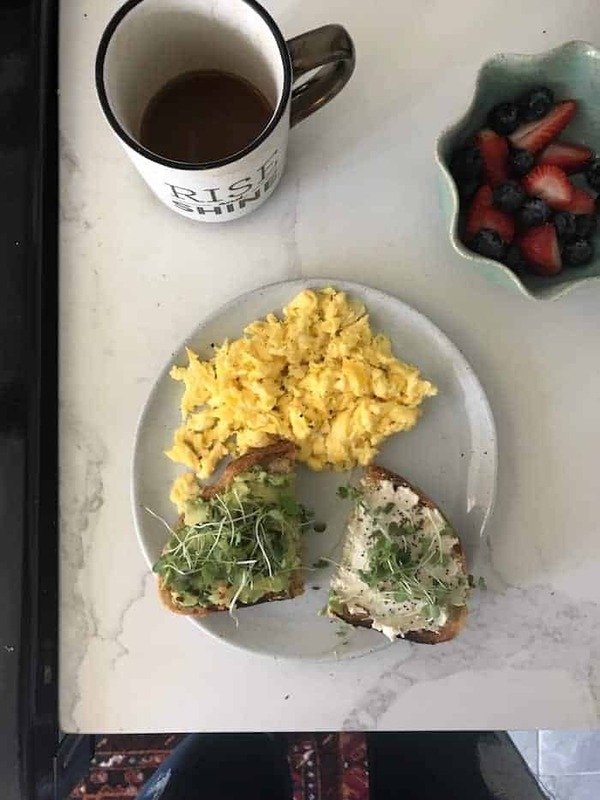 Half avocado and half homemade cashew cream cheese (method in this post), everything bagel seasoning, and micro greens from our CSA. With coffee, of course! 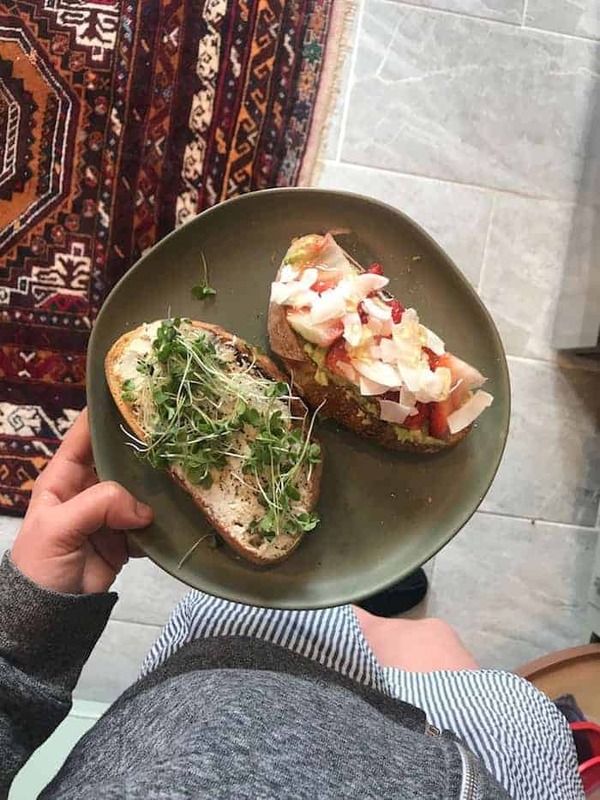 Double sourdough toast, one with strawberries, avocado, coconut, honey, and sea salt and one with micro greens, everything bagel seasoning, and lemon juice. 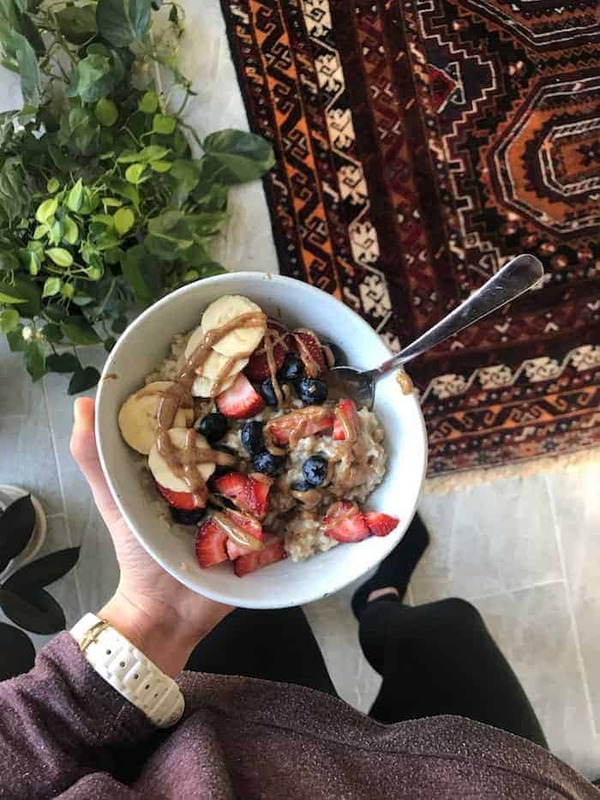 Steel cut oatmeal with blueberries, banana, strawberries, cinnamon, and almond butter. 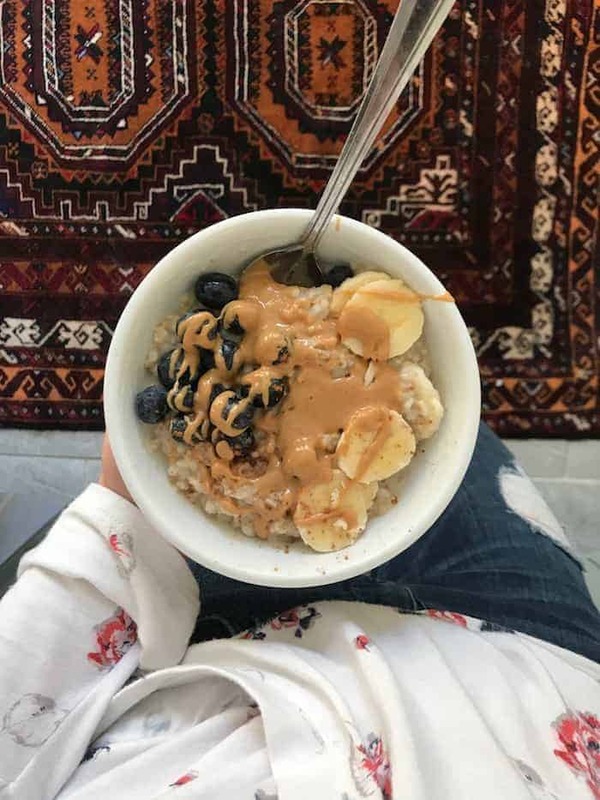 More oats with blueberries, banana, and peanut butter. 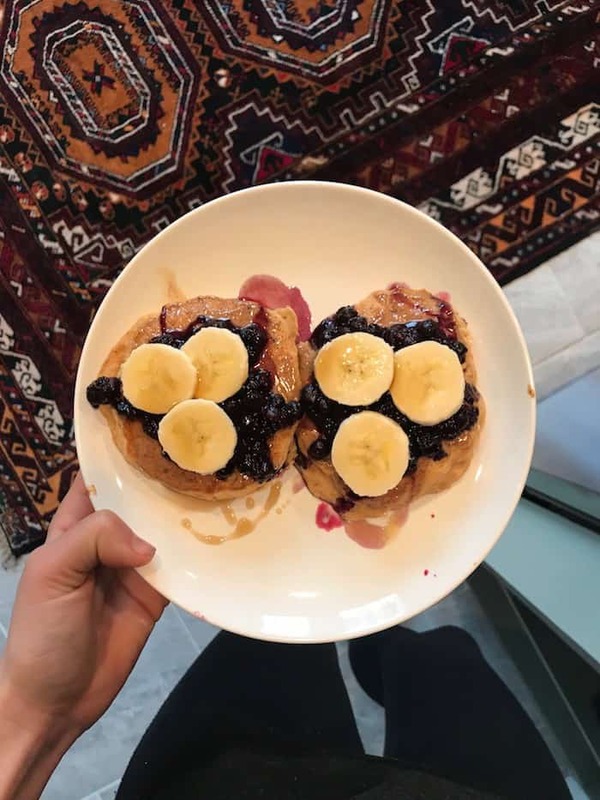 Pancakes with microwaved bloobs, banana, almond butter, and maple syrup. 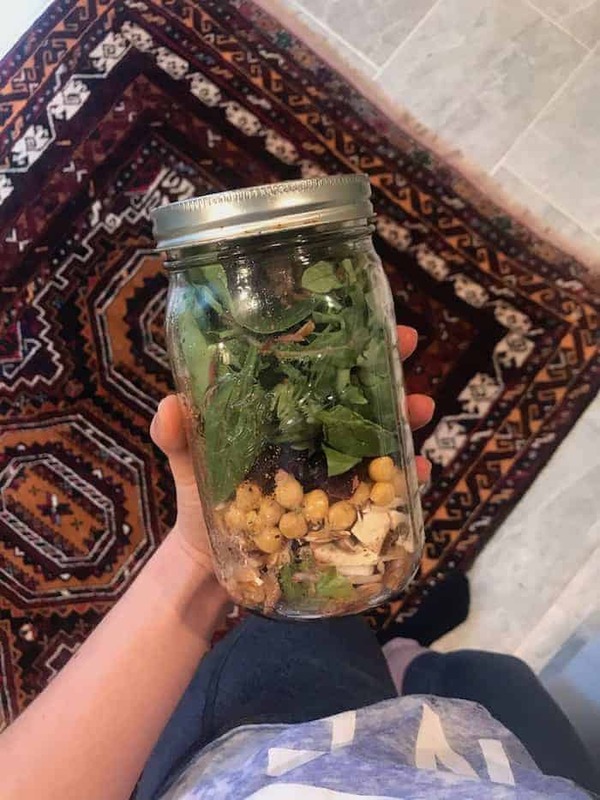 A salad in a jar with balsamic + olive oil, avocado, chickpeas, beets, mushrooms, power greens, and candied pecans. This and this are my fave mason jar salad recipes! 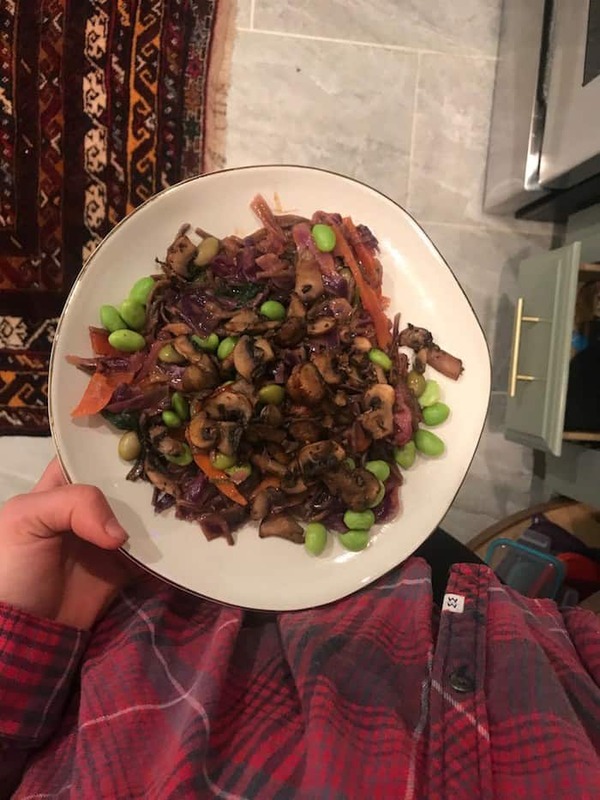 A big salad with leftover roasted tempeh, mushrooms, and cabbage, spelt berries, avocado, and power greens dressed with a mix of tahini, lemon juice, Dijon, salt, pepper, and garlic. YUM! Sheet Pan Cabbage and Tempeh Bake over greens. 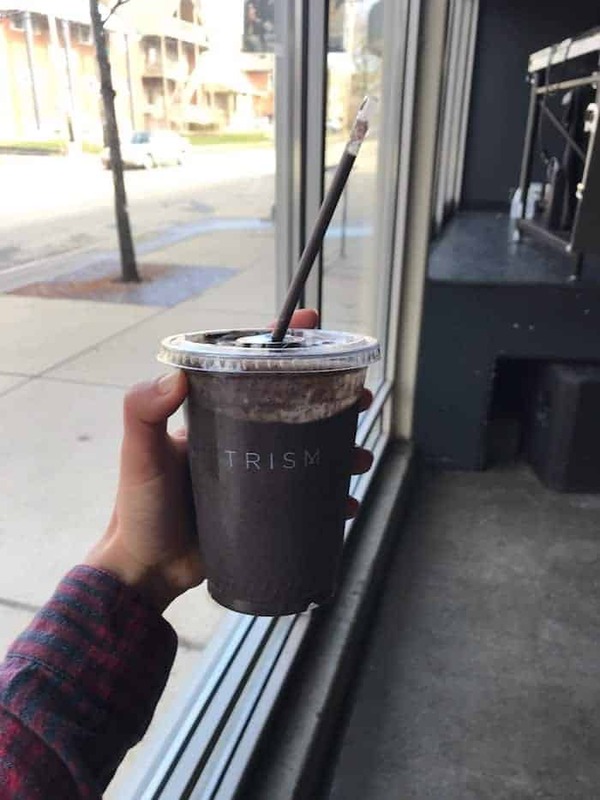 A loaded smoothie at TRISM with blueberries, banana, peanut butter, chia seeds, cinnamon, vanilla protein, and spinach. A Pink Cookie Bowl with spinach and spirulina topped with coconut, cacao nibs, and puffed quinoa plus some African Peanut Soup when I got home aaaaaand a couple hunks of sourdough. I didn’t feel like cooking last night so I grabbed everything that sounded good at Alchemy. This was a time when my stomach hurt and I felt way too full. I need to dial back in with my fullness cues. Oy! Thai Curry Soba Noodle Bowls. The Northstar Burger on rosemary focaccia with yummy salad and some of Jeff’s fries. My Easy Vegan Lasagna made with Explore Cuisine’s green lentil lasagna noodles and a really yummy salad with carrots from our CSA. 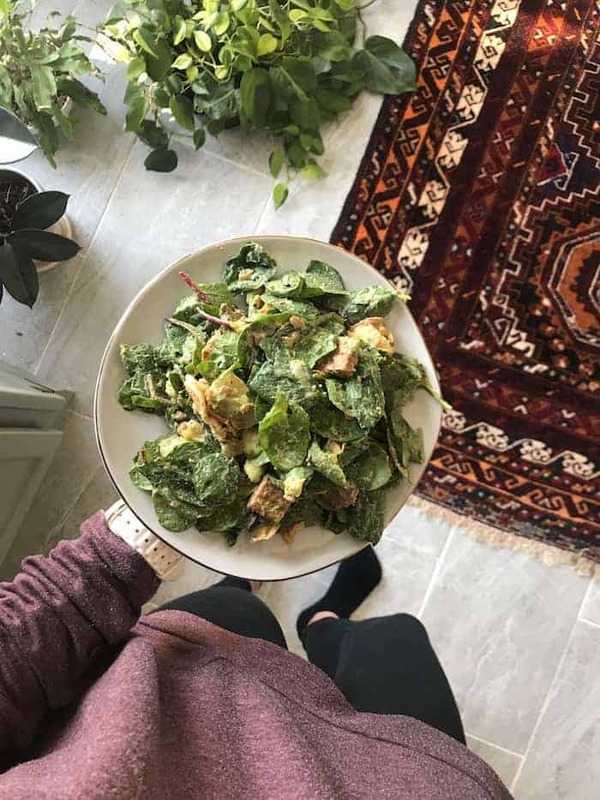 The dressing was a favorite of mine: a mix of lemon juice, tahini, nooch, garlic powder, salt, pepper, and a little water. 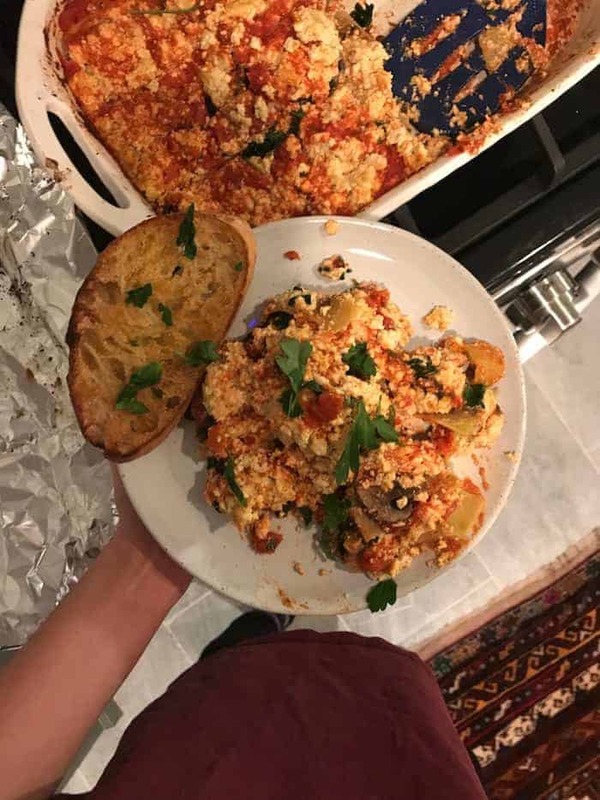 I also made garlic bread which was just sourdough bread with butter, garlic powder, salt, and nutritional yeast broiled on each side till browned. Pretty much our favorite dinner ever! 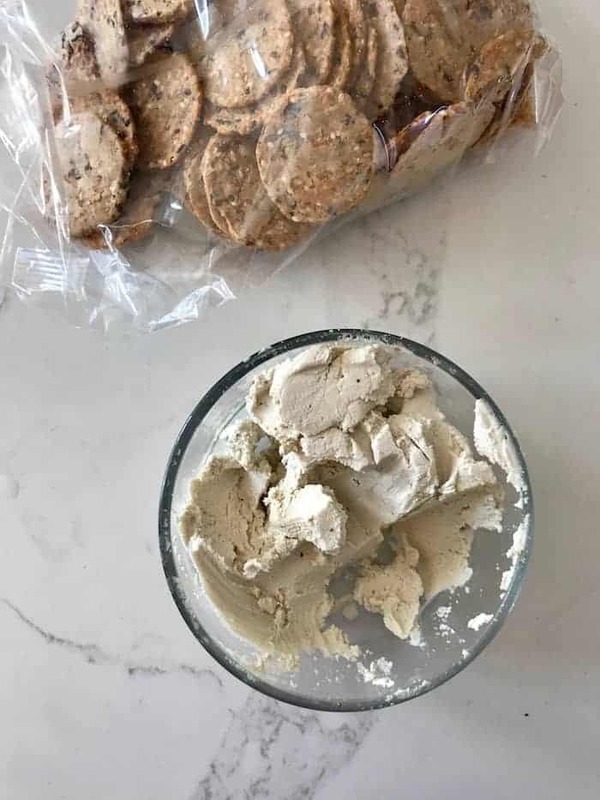 Mary’s Gone Crackers with my cashew cream cheese OMG. The most amazing brownies ever!! We had these every night with this fab coconut milk vanilla ice cream. Recipe coming tomorrow! These Lemon Blueberry Muffins that are so darn light and fluffy and heaven-sent. Recipe coming soon! Made in Nature’s pomegranate ginger snack mix that I’m in love with. I hope your week continues to get yummier. Do a random act of kindness for a stranger today! Fab eats, as usual! I’m sorry your tummy has been upset! Hope you feel better soon— sending love. I feel you about the stomach issues…I’ve dealt with similar sounding symptoms off and on. Sometimes I try illimated some things and found cutting out dairy and grain really helps with the bloating feeling. ok definitely going to be counting the minutes til that brownie recipe comes out!!! and why have i not tried toast with that avo/strawberry/coconut combo?! that sounds heavenly. and i looooove the made in nature snacks!! 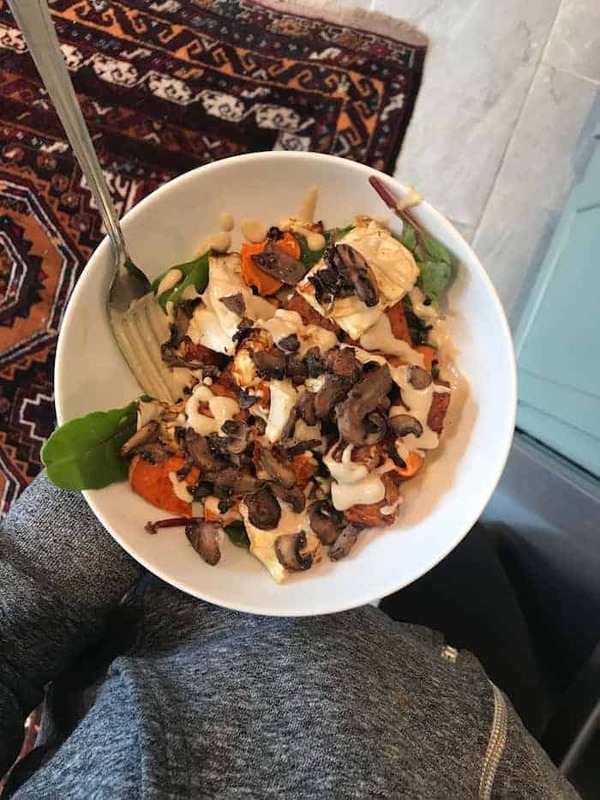 I can only speak for myself –BUT i can’t eat cashews OR peanuts—both make my tummy hurt–so perhaps it is not how much you are eating BUT what. I couldn’t do cashew cheese at all. Just a thought. Yum yum! That’s too bad about the tummy issues; it sounds like indigestion more so than too much food…I know for me, when I’m particularly stressed or haven’t been getting enough sleep, I have those exact symptoms. Or maybe increase some probiotics or decrease fiber if you have a lot. Hope it gets better soon! Agree with this comment- most likely excess stress, too much fiber, anxiety etc. I know of I chew gum or drink out of a straw I can get gassy too. Mmmmm that cashew cream cheese looks DIVINE – can you please share the recipe? It hurts reading this post because I want every.single.meal. ! Man I HATE feeling that overly full/gross/bloated feeling. I sure hope it subsides soon! I’m sorry you haven’t been feeling well! I had a gastric ulcer a few years ago and my primary symptoms were crazy bloating and a feeling of premature fullness, along with a gnawing/burning stomach pain. I really hope that’s not what you have but if your symptoms continue it’s worth looking into, luckily it’s pretty easy to treat with a quick course of PPIs. I hope your tummy trouble goes away SOON! I get that stomach feeling a lot…but I’ve also had a history with SIBO and I think that has something to do with it. 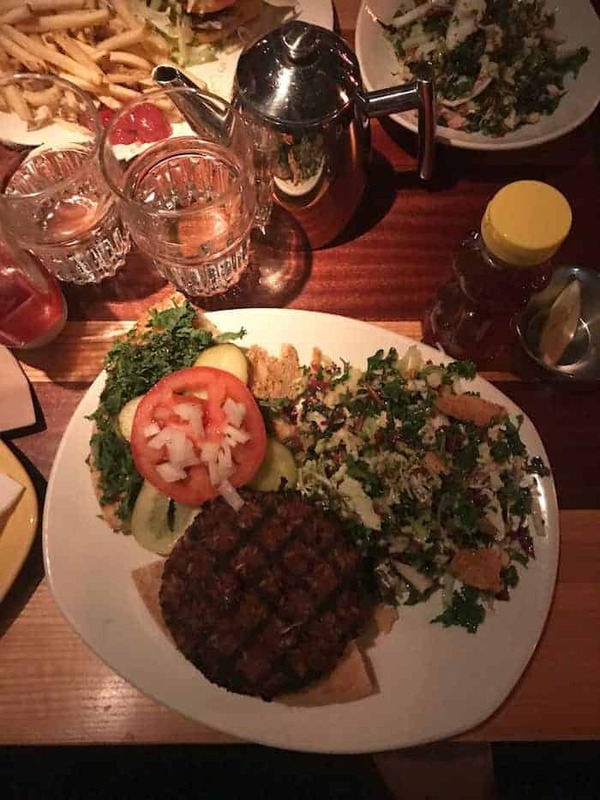 Your eats looks amazing as always…so impressed the variety that you are able to get into the week! I usually just make one big batch of something on Saturday/Sunday and eat the majority of the week so props to you! As always, a beautiful post! So sorry you’re having issues with your stomach! Have you compared your symptoms to those of people with gallbladder issues yet? May be worth a peek. Wishing you well!!! Your eats – always SO delish. And, I feel you about social media. While I’m working (from home), I’ve recently started leaving my phone in another room so that I’m not tempted to aimlessly scroll. Hope you’re having a good week! Hey! 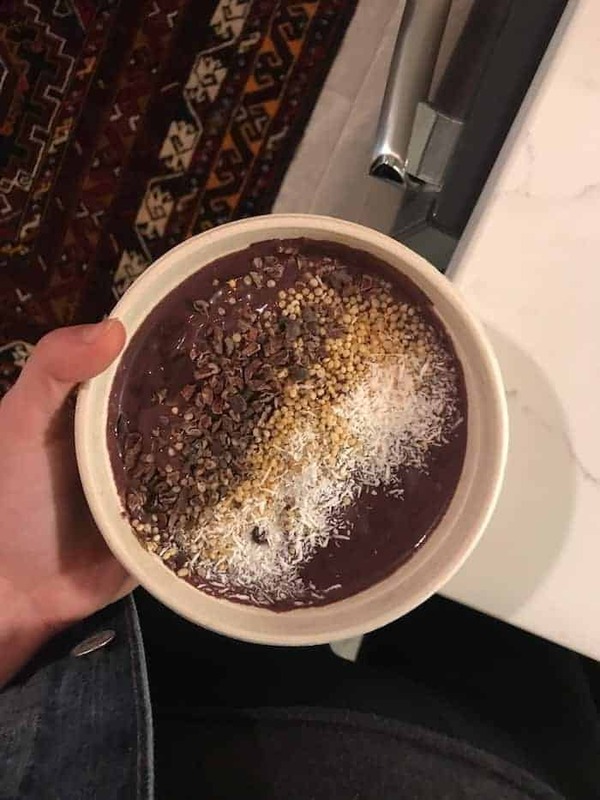 I don’t know if you eat smoothies for dinner very often or not, but I have found that sometimes when I eat a smoothie late in the day, it makes my stomach feel that same way. Bloated, gassy, painful, etc. Sometimes it happens if I eat fruit later in the day also. Just something I have become more aware of about myself! I don’t know a whole lot about food combining or eating fruits earlier in the day to help with digestion, but there may be something to it?! I hope you get it figured out!